2009 through 2010 wasn’t a good time for me, least of all musically. My early attempts at music criticism for “Oh Goodie!” quickly led to burn out, as I was either heavily disappointed or infuriated by what I was listening to. Attempting to listen Nickelback will do that to you. I’d had a fair amount of patience for what Weezer had done post-“Pinkerton”, but that patience was starting to run out around the time of the “Red Album”. The witty irony of Rivers Cuomo’s songs had been replaced with what I felt were cloying attempts at mainstream acceptance. No one should ever have to hear Rivers Cuomo sing the word “biyotch”. Then came the Lil Wayne collaborations. And the Coldplay covers. And the motherfucking sitar. Granted I didn’t have the brightest outlook on life at the time anyway, but this and a few other incidents made me feel that everything only exists to eventually disappoint you. Life is just a slow trudge through meaninglessness and misery, and then we die. There’s no point in being passionate about anything. …Shows what a pretentious, mopey prick I was, because Weezer eventually proved me wrong. While “Back to the Shack” is probably, overall, the weakest track on “Everything Will Be Alright In The End”, it’s a statement of purpose I don’t think I’ve ever heard from an artist before. Usually, you’ll see artists be self-deprecating and admit their failures only in interviews. The only artist I think I’ve seen talk about this in their songs before was Eminem apologizing for “Encore” and “Relapse”. That said, it’s an oddly genius move to show fans what this new record is about. Rivers is basically going: “Those pop/dance tracks we did that you hated? This ain’t that.” I fully admit it’s the track that made me sit up, take interest, and check out the record. A popular trend in reviewing new Weezer records is comparing it to “Pinkerton”, which I always found pointless. I’m neutral on “Pinkerton” myself, but if you love that record, don’t set yourself up for disappointment by hoping Weezer will make a direct sequel to it. 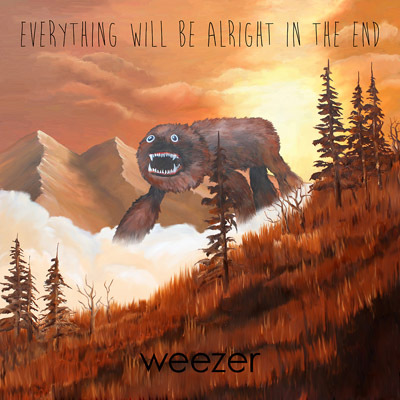 What “Everything Will Be Alright In The End” has done instead is take the emotional resonance of that record, then blended it with the crisp production and universal themes of their poppier material. It’s clear that the current status of the rock world is on Rivers’ mind, and Weezer’s place in it today. “Eulogy For A Rock Band” puts these feelings right on the forefront, feeling they’ve had “a good run” by “time moves on”. Rather than mimic the self-loathing portions of “Pinkerton”, it’s introspective while remaining lively. It’s not a dirge, it’s a celebration. It should be noted that, like the previous Weezer records, there are collaborations with outside songwriters. This time though, the collaborators are mostly fitting, as in they’re actually from other rock bands. Justin Hawkins co-writes “I’ve Had It Up To Here” (with Rivers even gamely mimicking his falsetto), Patrick Stickles of Titus Andronicus co-writes “Foolish Father”, and members of Ozma co-wrote “Eulogy”. Easily the best collaboration though, and possibly the best track on the album, comes from Bethany Cosentino of Best Coast with “Go Away”. Presented as a back-and-forth duet between a couple breaking up, she and Rivers have remarkable vocal chemistry. The premise and lyrics are a tad simplistic, but not in a bad way and the emotions of the singing and music are what carry it, particularly during the bridge. The album even ends with a multi-section piece known as “The Futurescape Trilogy”, beginning with the menacing fuzz-laced instrumental “The Wasteland”, continuing with the piano-led group sing-a-along of “Anonymous”, ending with the bombastic “Return to Ithika”. Unlike the disastrous “Greatest Man Who Ever Lived” on the “Red Album”, this one rarely gets bogged down and is just plain fun. A great way to end the record. So why go on about all this? Why write a week’s worth of comic strips on the matter? Because I feel in today’s day in age, it’s easy to cry out “worst thing ever”, write certain artists off because we were disappointed, and never give them the time of day again. We have to remember they’re people too, and we need to remember to still being open to being surprised and delighted by what they do, especially if we don’t expect it. A moment’s disappointment is no reason to cut yourself off completely. Weezer has made some bad music. I don’t discount the idea that they can still make bad music in the future. But I recommend “Everything Will Be Alright In The End” because it actually made me feel something and think differently for a change. To sell certain entertainment short is to sell your own experiences short.